The virtual reality rave was the point when things started to get really weird. To an eardrum-vibrating techno beat, while wearing a Daft Punk-style moon helmet, I found myself wobbling on a spinning dance floor, interstellar holograms flitting across a wraparound video wall, while a high-pitched Japanese cartoon DJ shrieked at me to dance faster. Apparently, I wasn’t quite harnessing the power of the music. Normally, I’d need a stiff drink by this point – the occasion certainly demanded it – but the club was a fake, the other disco-goers were computer generated, and the bar was stocked with empty vodka bottles. But there was little time to argue: I was about to be catapulted through space at 270km/h on the world’s fastest virtual reality rollercoaster. Welcome to Huis Ten Bosch, Japan’s wacky Dutch-themed amusement park, located in Sasebo, outside Nagasaki on the southwestern island of Kyushu. It’s a place where the worlds of manga, Mario Kart and the make believe of Steven Spielberg’s latest sci-fi flick – Ready Player One, released 30 March – collide with canals, lush tulip fields and classic windmills. Imagine a quaint village from the Dutch golden age, gabled and gilded, but plonked on a Japanese harbour, then populated by robots and dinosaurs, and still you’re only half way there. This head-scratching quality has been Huis Ten Bosch’s defining characteristic since it opened 25 years ago. And I was beginning to enjoy the absurdity with every passing cobble. Over there: a robot barman making piña coladas. To the right: a wacky dog-grooming parlour. Ahead: an entire city block, girded by canals, themed around the horror video to Michael Jackson’s Thriller. If you think that sounds daft, there was plenty more besides. Next, I popped my head into Schiphol, the park’s ‘duty free airport’-themed souvenir shop. The Japanese have a serious obsession with theme parks. From Kagoshima to Kyoto, teenagers obsess over kawaii, the culture of cuteness, and theme parks are cannily marketed as once-in-a-lifetime destinations. If proof were needed, three of the world’s five most popular amusement parks are in the Far East, including Tokyo’s Disneyland and DisneySea and Osaka’s Universal Studios. Then there’s Fuji-Q Highland, bubbling over with endorphin-boosting rollercoasters and Sanrio Puroland, a soft-play kiddies Xanadu that’s home to the phenomenally successful Hello Kitty brand. 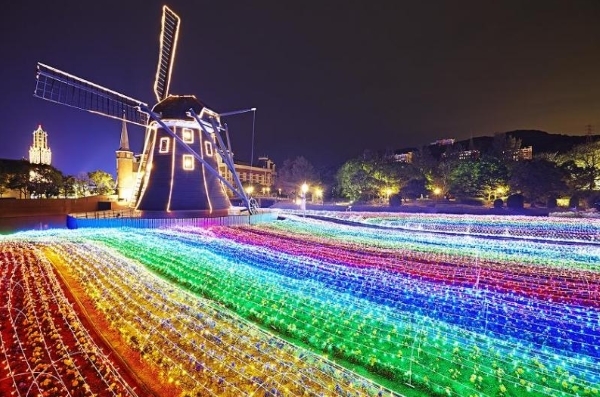 Huis Ten Bosch, for its part, has some 50 attractions, including the largest virtual reality experience in Japan. While some park-goers raced around with urgency and purpose, on a box-ticking itinerary of eccentric thrill rides and themed lands (as well as Michael Jackson’s Thriller City, there’s Amsterdam Square, Adventure Park, Art Garden and Attraction Town), others took a slower, more reflective meander through the streets, savouring the Technicolor Holland of their imagination. The park was conceived in 1992 as homage to the Dutch, who first arrived in 1609 when the Dutch East India Company created a hub for trade on nearby Hirado island. The endeavour led to full-scale copycat canals, fountains, merchant houses and marketplaces spread over an area of seafront bigger than Monaco. Leaving no stone unturned, they went as far as building a brick-by-brick replica of the 17th-century Huis Ten Bosch palace, official residence for the Dutch Royal Family in The Hague. In total, they used some 1.75 billion stones imported from the Netherlands. I thought of all this while strapped into a harness for a virtual reality reverse bungee jump, a vertiginous trick that catapulted me above an achingly real New York skyline. The virtual reality fishing, up next, required far less bravery. So, too, the virtual reality taiko drumming. But I couldn’t help but notice that all the time jacked-up teenagers were disappearing into the park’s ever-expanding fake worlds seeking out fake thrills. Wasn’t real Japan far more interesting and entertaining? I guessed not. I missed the evening parade featuring 7m-high inflatable cats, but managed to catch the nightly illumination show. As darkness fell, the sky shimmered and dazzled, the park lit neon by some 13 million decorative lightbulbs and virtual reality firework projections. Weirder still, after 3D monsters crawled across the rooftops in a feat of technical wizardry, the end-of-show applause from the crowds came with dead-eyed seriousness. What they had just witnessed, I thought, must have felt like the most normal thing in the world. It was a fittingly odd end to my visit, and a reminder that Japan’s cultural whims often lie so utterly beyond our UK understanding. It was a long way to come for a Heineken, but a once-in-a-lifetime destination nonetheless. Finn Air flies seasonally from Heathrow, Edinburgh and Manchester to Fukuoka from April to October, connecting in Helsinki, from £665 return (finnair.com). Huis Ten Bosch and Sasebo are a 3 hour train ride from Fukuoka. There are four hotels within the park boundaries, the best of which is Hotel Amsterdam, a faux grand dame with interiors styled on Europe’s Victorian-era landmark hotels. Doubles from £500, including breakfast and two-day theme park entry.